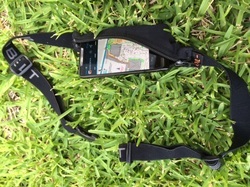 There are at least 3 easy ways to carry the SmartPhone device whilst Orienteering, in addition to simply running with it in your hand. MyOMaps continues to function, when the smartphone is put into suspend mode (blanked screen and non-responsive to screen touch). MyOMaps continues to record the track and detect (and vibrate/beep) at control locations. 1. On your forearm - This is useful if you are mapping or in a training mode where you want to look at the electronic map; course or track. This image shows that a popular iPhone holder can be adjusted to be used on your forearm. 2. On you upper arm - As is the common position for carrying a smartphone whilst walking or jogging, using a standard sports case for a smartphone can be effective, particularly if you are not needing to interact with the device (eg in competition mode). 3. Around your waist (front or back) - This position is NOT recommended is it reduces the effectiveness of the GPS tracking. 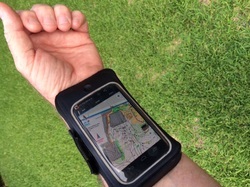 It has been found in practice that the quality of the GPS track recorded is much lower than having the phone in your hand or on your upper body.